Recent events involving youth hockey players at ice rinks have cast the national media spotlight on the air quality inside rinks around the country. Both incidents, which involved players becoming ill due to carbon monoxide and nitrogen dioxide poisoning, are serious and pose important questions for our industry. With that said, it’s critical for everyone who steps into a rink to know that the ice rink industry has long been committed to ensuring the health and safety of its customers as well as rink employees by creating and following a set of strict guidelines. Inadequate facility ventilation equipment and/or equipment that has not been maintained on a regular basis by a qualified professional. Ice resurfacing and maintenance equipment are not the only potential contributors to poor indoor air quality in ice rinks. Any equipment that burns fossil fuel (gasoline, diesel, propane, natural gas) such as infrared bleacher heaters, hot water heaters and boilers, furnaces, forklifts, scissor or boom lifts, generators and idling buses outside the rink can all contribute to unacceptable levels of carbon monoxide and/or nitrogen dioxide if not used and maintained properly. Carbon monoxide is a colorless, odorless, tasteless gas, which reduces the oxygen-carrying capacity of blood. It is the product of incomplete fossil fuel combustion. Common symptoms of exposure to high levels of carbon monoxide are headaches, drowsiness, rapid breathing, nausea and vomiting. Nitrogen dioxide is a dark brown or reddish brown gas that has a pungent, acrid odor. It is an unwanted by-product of fossil fuel combustion. Common symptoms of exposure to high levels of nitrogen dioxide are irritation to eyes, nose, throat and respiratory tract or shortness of breath. More serious symptoms include pneumonia or bronchiolitis. 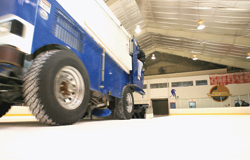 quality specific to indoor ice rinks for carbon monoxide and nitrogen dioxide exposure. However three states, Massachusetts, Minnesota and Rhode Island, have put regulations in place for indoor ice rinks. Each state’s regulations are similar, and are enforced by their departments of health. 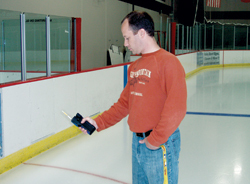 These regulations outline air sampling requirements, record keeping requirements, air action levels and required corrective measures that must be taken by the rink operator. What can your local ice rink do to maintain acceptable indoor air quality? Serving The American Rinks, which was founded by USA Hockey and U.S. Figure Skating in 2000 to provide education and resources for rink owners and operators throughout the country, recommends that all ice rink operators in states that do not already have indoor air quality guidelines follow the State of Massachusetts’ 105 CMR 675.000, which can be found online at Mass.gov or Starrinks.com. 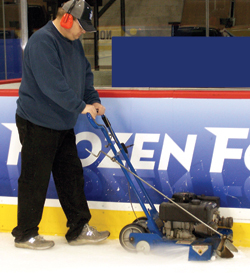 Fossil-fueled ice resurfacing and ice edger equipment should be emissions tested and tuned to manufacturer specifications annually by a qualified professional. Heating, Ventilation & Air Conditioning equipment should be inspected and maintained quarterly for proper operation by a qualified professional. All rink staff should be trained how to properly use air sampling equipment and what appropriate corrective actions to take upon discovery of an air sample that exceeds maximum carbon monoxide and nitrogen dioxide exposure limits. 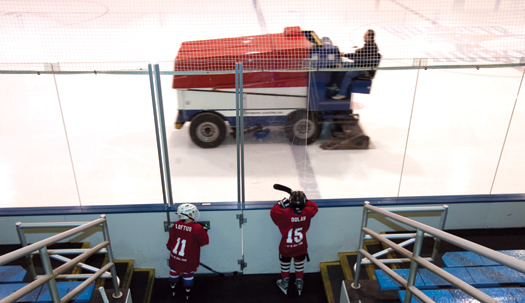 It’s important to know that the majority of ice rinks in the U.S. do an outstanding job of offering a safe, clean and fun environment for kids and adults to play hockey. Unfortunately, there are exceptions and STAR is committed to doing everything possible to help eliminate those exceptions. As an industry leader, STAR addresses the issue of indoor air quality at educational seminars it conducts throughout the year. In addition, USA Hockey has reached out to government agencies nationwide to heighten concerns surrounding indoor air quality in ice arenas. As a player, parent, coach or official you have the right to expect a clean and safe environment every time you step into a rink. If you have questions or concerns about the air quality in your local rink, ask your hockey association leadership to speak with the rink management about what steps the rink staff is taking to provide a safe environment.